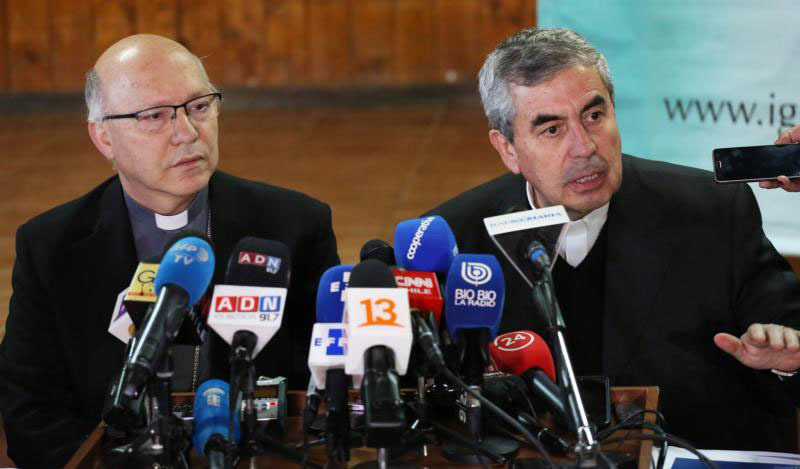 SANTIAGO, Chile (CNS) — Chile’s bishops acknowledged they had “failed to fulfill our duty by not listening, believing, attending or accompanying the victims of grave sins” after a five-day meeting to discuss the clergy sexual abuse crisis rocking the country. Bishop Santiago Silva of the Military Diocese of Chile, president of the bishops’ conference, also apologized to abuse survivors for the bishops’ failure to “react in time to the painful sexual abuse and abuse of power and authority” as the general assembly concluded Aug. 3 in Punta de Tralca on the Pacific Coast. He outlined a series of steps the bishops would take as they released “Declaration, Decisions and Commitments of the Bishops Conference of Chile,” a set of national guidelines for responding to abuse allegations. The guidelines were developed during the assembly. In recent weeks, the National Prosecutor’s Office of Chile has raided church offices and launched an investigation into cases of alleged sexual abuse involving 158 church officials. Every Chilean bishop in May offered his resignation to Pope Francis after a three-day meeting at the Vatican to discuss the clerical sexual abuse scandal detailed in a 2,300-page report compiled by Archbishop Charles Scicluna of Malta and his aide, Father Jordi Bertomeu. To date, the pope has accepted the resignations of five bishops. During the general assembly, Auxiliary Bishop Fernando Ramos Perez, apostolic administrator of Rancagua, Chile, announced that two priests had resigned. Fathers Hector Fuentes and Freddy Gorigoitia, parish priests in Rancagua, are part of an investigation involving 14 priests accused of sexual abuse. Cardinal Ricardo Ezzati of Santiago has been summoned to speak with prosecutors Aug. 21. Investigators are looking at claims that the cardinal and others covered up information about the 14 priests accused of systematically abusing minors. Critics have demanded that Cardinal Ezzati resign and protesters have disrupted his Masses at the cathedral in Santiago.